This has been on CL on & off for several months. A garishly painted SR500, just another example of painting too much of a bike to make it totally FUGLY. Oh. The best part, besides the outlandish asking price of $5500????
" Will trade for 2004 or newer 600 or 1000's or Ducati plus cash"
The 'Tune Up' could have been a full service at a Dealer. That would explain the $500 pretty easily. As we can see, every bike has its proponents and its detractors. It is odd how the negative views tend to be the loudest. These types of threads are nothing new. Some (looking in mirror) tend to focus on the ads with absurd descriptions or egregious errors. Others highlight bikes they don't care for and make that point abundantly clear. Not enough point out the good deals or otherwise interesting bikes for sale. 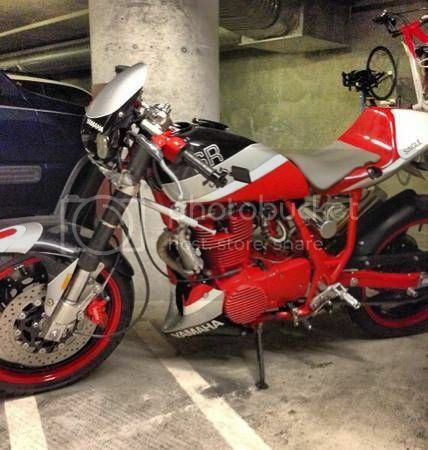 With apologies, declaring the seller of the red/white SR500 as the "Delusional Douche of the Year" (in bold with key words capitalized) could in itself be a contender for "Most Inappropriate Labeling of Someone You Don't Know" post of the year. My post was an April Fools joke, that bike is hideous. Any guesses as to what it might be? He/she will text or email you the details. It takes too long to type it all out in the ad. No but when I posted it it was..
Black and red? Matching gear? Must be Ducati. B) There would be anyone that would consider trading a Ducati plus cash for it. SR500s in stock trim are well loved in the world of vintage bikes. The seller has taken a good bike and basically ruined it, and is now serious in his belief that it's worth far more than what a clean, low mileage example is. So, since you think I'm in the wrong for labeling someone who clearly appears delusional, and as a person whose occupation appears to be flipping bikes for profit, what is your professional opinion on the worth of that bike as it sits?? 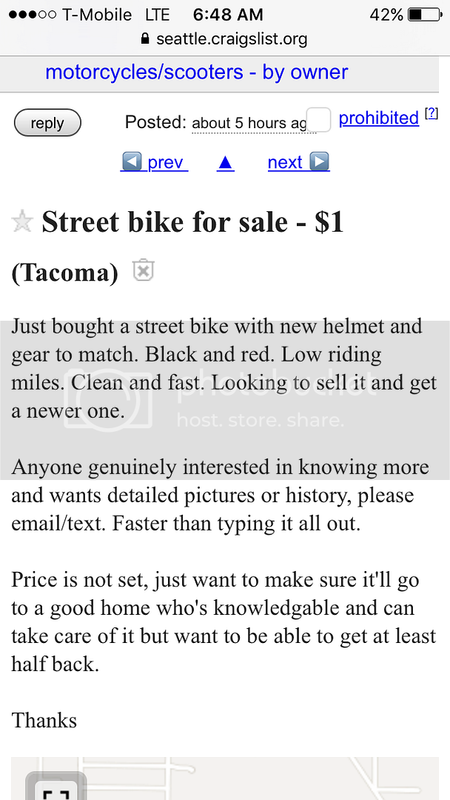 All I need to know about the seller is contained in the text of his ad, especially regarding the two points above. Sorry for the preachy post this morning Q-girl. I'm not even 50 (yet) so I have no excuse. I guess I'm just too semantic for my own good. The ad is far from the worst. The bike is far from the most overpriced. Therefore the owner/seller is not the biggest douchebag nor a candidate for db of the year. That being said, yah, what a mess of an 'SR. Horrible. IMO it's worth exactly nothing. Remember that, while the owner may be delusional, there is no shortage of those so affected. All it takes is one. I guess I was also a bit "over the top" in my sentiments regarding the seller, but I just don't understand how people can be so delusional. As to the bike being worth nothing, I'd have to disagree...depending on how well it runs, and what it would cost to repaint the entire thing back to stock trim. If a person could get it cheap enough, it might be worth doing, but I think it wouldn't be worth it unless it could be obtained for no more than 20% of his current asking price. It would be a boring world if all bikes looked the same, but I find it really sad and almost tragic when I nice vintage bike is ruined so badly. Ugh! Value tends to be in the eyes of the beholder. That being said modifying a bike even "tastefully" can net you nothing more in the end, but the Blue Book price.